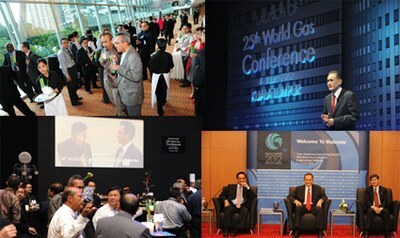 The 25th World Gas Conference took place 4-8 June 2012 in Kuala Lumpur, Malaysia. The proceedings from WGC2012 can be found on this link: WGC 2012 Proceedings, but can also be found on the menu to the left. Photos from the official launch of WGC 2012 on 5 November 2009. Over 5000 industry professionals attended, ranging from CEOs of leading organisations, government officials, and industry technicians. Delegates heared from 500 speakers, networked with thousands of decision makers and explored the latest in technologies & developments within the gas industry.